More then a dozen survivors who lost every thing to the super cyclone that struck coastal Orissa on the night of October 29, 1999, have been healing their wounds in their own ways. After losing their wives, many men have sought to rebuild their lives and hopes by marrying the women who were widowed by the cyclone. In a society where marrying a widow is still frowned upon, these men have taken the road less travelled. Jadab Das, 35, of Kiada village, which is part of the Erasama subdistrict in Jagatsinghpur district, lost his entire family to the cyclone. "I had a wonderful wife, three sons, and a daughter," he said tearfully. "The cyclone water, which rushed into our village on the night of October 29, 1999, swept them all away. My elder son, Gouranga, was 14 years old and my other children were below eight years. My wife was very beautiful and very caring. When I saw their bodies, I was in a state of shock." Das recalls that it was during the painful days of coming to terms that his family was no more that he first met Gouri Kandar, who could clearly empathise with his grief. Gouri, who also hailed from the Kiada village, has lost her husband, three sons, mother, and father-in-law to the cyclone. "There was no one to take care of me. I was a widow and I doubted if I would have been able to live much longer alone," she said. Das and Gouri shared a similar tragedy. "She shared her pain and suffering with me and we got married," said Das. As per Hindu social customs, after losing her husband, Gouri was forced to break the glass bangles she wore on her wrists and remove the vermilion mark from her forehead, all of which symbolize widowhood. She also draped a white sari to avoid social ostracism, which is as per tradition. "I met Jadab and he too was suffering. We both had lost every thing. But we both decided to fight our pain and frustration and this brought us together," she told rediff. Gouri no longer wears the symbols of widowhood. She now drapes a coloured sari, marks her forehead with vermilion, and wears bangles on her hands. Interestingly, the entire village, where every resident had suffered in some way or the other due to the cyclone, supported the widow and widower getting married. "Just three month after the cyclone, we got married in a temple in a simple ceremony and since then we are leading life together as wife and husband. We have the blessing of all the villagers," said Gouri. The two have already started a family. "We have two daughters. The eldest is one and half years old and the other is just six months old," said a proud Gouri. The Tata Company, one of India's leading industry houses, had pitched in to help the survivors of the cycle and Kiada village was one of the beneficiaries. A grateful Jadab and Gouri soon got a house to live in. "The ex gratia money we received from the government, about Rs 600,000, we have deposited in the bank for our daughters' future," said Gouri. "We often remember our lost family members, but we sit and only cry together and this is how we share each other's sorrow," she added. The October 1999 cyclone affected 17,993 villages and 46 towns lying along Orissa's coast. The total affected population was19 million. According to the government, 8,479 persons lost their lives, but unofficial estimates are twice as high. Nearly 8.26 million people became homeless. The total livestock killed was put at 2.48 million heads. The state government estimated the total damage at Rs 62.28 billion or US $1.35 billion. Jadab and Gouri are not alone in marrying each other to help recover from the shock and horror of the cyclone. According to Madhusudan Phandakar, a member of the village council, a 28-year-old woman, Chhabi Pal, who lost her husband and parents-in-law, has married a person in the Midanapore village, which lies in a neighbouring district. Similarly, there would be at least a dozen such cases where people are trying to rebuild their lives with another such affected person. The cyclone widowed thousands of women and men. There are also been a few instances of man taking a widow from a cyclone-ravaged village as his second wife, according to a former village head of Ambiki village, which neighbours Kiada village. In one such case, 22-year-old Manju Das, mother to a son and a daughter, married 28-year-Basudev Mandal in Ambiki village. Manju lost her former husband to the cyclone. Basudev already has a wife, two sons, and a daughter. 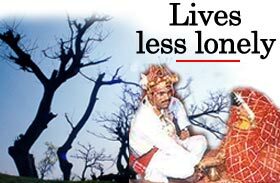 Basudev told rediff that he could not bear to see the anguish and suffering of Manju and "adopted" her as his second wife after marrying her in the village temple.